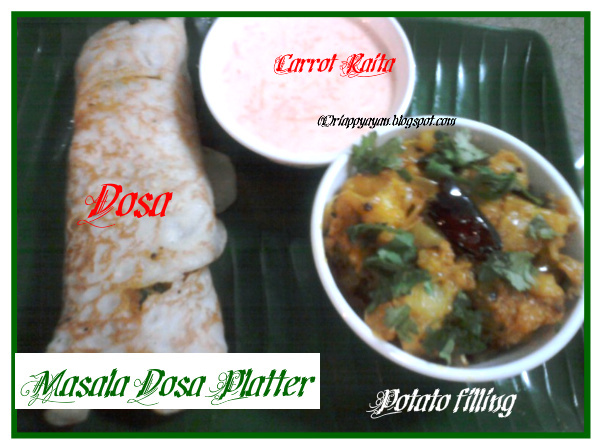 Today I'm posting a widely popular Indian food and one of my favorite thing to eat, The recipe of Dosa. Dosa, is a fermented crepe or pancake made from Rice and Black lentil/Urad Dal. Dosa, belongs to South Indian cuisine, typically eaten for Breakfast. Though sometimes considered a breakfast dish, dosas are also eaten at other times of day. Those with wheat or gluten allergies will find the dosa a nice addition to their diets. They can be stuffed with vegetables and sauces to create a quickly prepared meal. There are 1000 varieties of dosas available, sometimes specific to a region in India. Dosas are typically served with a side dish which varies according to regional and personal preferences. Mostly it is served with Sambar(red lentil soup) and a chutney like coconut chutney and sometimes a little drop of pickle. Today, I'm sharing here the most popular Dosa of all, Masala Dosa, where a potato filling is placed at the center of the dosa, wrapped and served with chutney. A perfectly made dosa is a pieces of art. I have to admit here, I'm not good at making crispy dosa. If you want to learn, refer to this page. I make this whenever I need a quick but filling lunch or breakfast. Soak 1 cup urad dal(black gram lentil), 2 cups rice and 1 tsp methi seeds(fenugreek) for 5-6 hours(the measurement is very important for making dosa. The ratio of rice and dal always is 2:1). Grind to a fine paste adding water. Keep it overnight for fermentation. Next day mix the batter well adding salt. The consistency of batter is similar to regular pancake batter. The batter is ready for making dosas. Please refer to this page for step-by-step instructions of making dosas. Dessicated coconut : 1 tblsp. Lemon Juice : 2 tsp. Urad dal/black lentil : 1 tsp. Grind together coconut and 1 green chilli in a coffee grinder. Transfer the mixture to a small bowl, add lemon juice, salt and 1/3 cup of water. Mix and set aside. Boil potatoes and cut into small chunks. Slice the onions. Heat oil in a pan, add first the red chilli, and then the rest of the ingredients. When seeds start to crackle and dals are almost brown, add sliced onions. Fry, stirring regularly, after 2-3 minutes, add chopped ginger and green chillies. When onions are golden brown, add turmeric, cumin and coriander powder. Cook for 1 minute. Then add cubed potatoes and coconut mixture. Stir until pototoes are heated through and the water is completely absorbed. Check the seasoning. Remove from heat and garnish with coriander leaves. Keep it hot until you make your dosas. Chana dal : 3 tbsp. Urad dal/black lentil : 1/2 tsp. Mustard seed : 1/2 tsp. Grind all the ingredients in your wet gringer using very little water. Heat oil in a pan, add the tempering ingredients except hing. When they start to crackle, then add hing and remove from fire. Immediately add coconut and mix well. 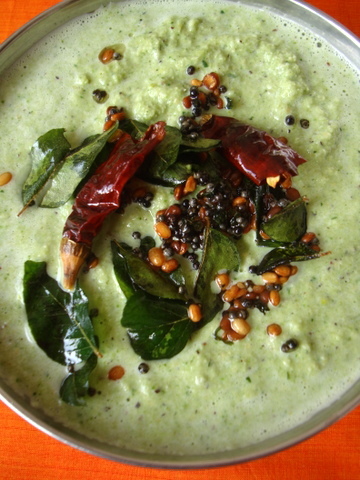 For green coconut chutney, add 1 cup finely chopped mint or coriander leaves while grinding coconut. After making the dosa, place little potato filling at the center of the dosa, fold dosa from both sides and serve with coconut chutney or whatever you like. My new blogger friend and follower of my blog, Chaitrali of I-m-not-a-chef has shared "Sunshine Award" with me. This is the first award of this blog. This is awarded to bloggers whose positivity and creativity inspires other in the blog world. Thanks, dear Chaitrali, for this recognision..You are the one who inspires me and I learnt so many new recipes from you. Visit her blog for all types of yummy and healthy recipes from around the world. Share the love and link to the person from whom you have received this award. These are the 12 bloggers I have chosen this time for this award..it's really tough job to choose only 12 blogger buddies, but I did it finally..
Masala Dosa looks yummy. Excellent combo. That dosa platter looks like from a restaurant around the corner..very nicely done! Congrats on the award dear..well deserved..wish you many many more to come! Wowww masala dosa makes me hungry, very tempting..
Masala dosa looks tempting. Congrats on your first award..
the pic of dosa platter slightly blur but the Coconut Chutney looks very yummy. Congrats to you on your award! Yummy dosas! Thank you so much on sharing the award with me. I am really honoured. 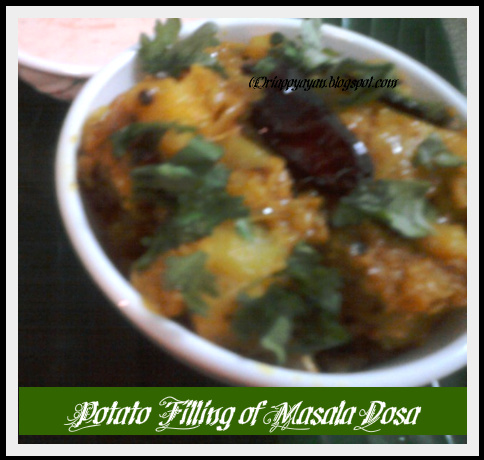 congrats and masala dosa is my fav too.....I am first time here....lovely blog dear.